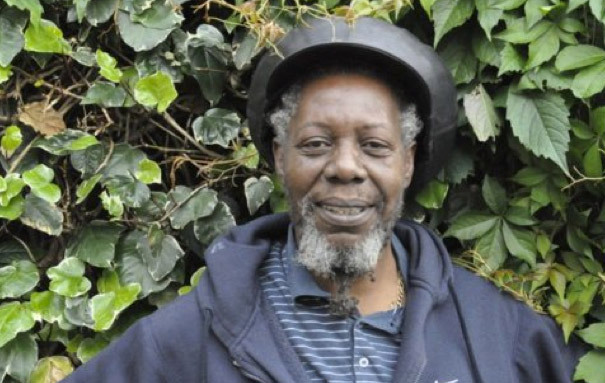 Throughout his career Popsy has sung in a string of reggae and r'n'b bands, being backed for live performances by musicians from Talisman, Black Roots and the Atlantic Rollers. His bands -Chris Parker and the Unites, The Mellon Ears, Black Flames, Vibes (now Handsome and The Positive Vibes)- and solo work as Popsy Curious have seen him play gigs all over Bristol and the south west. During the 80s Popsy ran a shop on Grosvenor road and was in a prime position to watch the St Pauls riot of 1980 unfold when police came to raid the Black and White Cafe. In this interview he discusses the build up of tensions that lead to the riot as well as the disastrous court case that followed. Prior to coming to England at the age of 16 Popsy spent his early life in Jamaica. When his grandmother died he left his hometown hoping to join The Maytals, went to Kingston to audition for Duke Reid and even tried to leave the island by stowing away on a boat but gave up -in twainian fashion- when the hold became too cold. His 1992 album YouthMan Mind has been re-mastered and is available from Bristol Archive Records. This article was conducted in collaboration with Bristol Archive Records. Hi, it's Alex from the Jeli Sound Archive here. We're going to be interviewing Popsy Curious who has from the 70s all the way up to the present day been involved in reggae, rhythm and blues, and ska music. He is a singer and has been involved with several quite popular bands in Bristol. So what were your early musical experiences? My early experiences when I was a youth in the Caribbean I used to love to listen to The Wailers and The Maytals. They were my inspiration. I was living in the country and one day I ran away to Kingstown to where they were making the music because I wanted to join The Maytals. While I was in Kingstown I was working on the music. We went to Duke Reid but my mother sent for me in this country so I had to cut everything there and come here to England. When I came here that's when me and my little brother Zedy [pet name] started to do our thing. Then I formed Chris Parker and the Unites. From Chris Parker and the Unites I moved onto The Mellon Ears which was Buggs, Magguwan and myself Popsy. After The Mellon Ears I joined with Buggs again at a later date with other members into Black Flames. From Black Flames to Vibes then to Popsy Curious then to the present day and Positive Vibes. Popsy Curious that's your solo name isn't it? So how did Vibes form and when was that? That band formed in the 80s because we had some breakdown in Black Flames and everyone seemed to go and do their own thing. Some members of Black Flames and myself, Winston Minott We joined together and bring in this girl called Veronica and she was very good. We started to hit it off. I went to Jamaica and when I came back they went to London to live. I didn't want to go to London so I went solo. So what kind of music were you? You were a three piece singing group? With Vibes? Yeah, we were a three piece, singing lovers rock and roots music. In Bristol, we played in Wales, we played in Cornwall and where we could get jobs. Vibes was three core members. You Winston and Veronica. You got bands to play for you. What kind of bands did you get to back you? We got people like Talisman to back us and we found session people and put our own thing together. One Brother called King he's dead now. He used to be the bass player in Black Roots, he used to play with us. Another brother called Mark [drummer] and Damien [lead guitar whose wife was also the bassist] and Rob [rhythm guitarist]. They used to play with us. So what was your recorded output? Did you record any albums? Well, yes with Black Flames we recorded and album. It's mostly rhythm and blues and a lot of the sounds we did on there were cover versions. With Vibes now we write our own things. We recorded an album which I hope will come out because we put them in the cupboard but it's all full now. So everyone can hear it. So that will be coming out on Bristol Archive Records isn't that right? So going back to Black Flames how did that come about? Well, Buggsy after we broke up from The Mellon Ears he formed Black Flames. Him and Glen Crooks and Joshua Moses and Lewood and some people in a band up by Lancashire up by Manchester, Liverpool. They came and signed up the four of them and went up there. Me and Buggs were always singing together, he never left me out. I went up there to see them perform but he wasn't happy up there so he came back to Bristol. After he came back to Bristol that's when he reformed Black Flames but Joshua wasn't back with it then. Lewood is still up there. It was me, him, Glen Crooks, and Winston Minott. We formed Black Flames and Steve Reid he was the guitarist. It took off, it was good. Everyone seemed to like it because we did rhythm and blues, mostly like The Drifters. The people seemed to like it. Where did you play, did you play St Pauls carnival? Yeah we played St Pauls carnival. We played all about. We played Weston-super-Mare. We played all about the place, we played in Wales as well with Black Flames. So do you have any anecdotes from back in those days, maybe involving notable people? Well, I knew lots of the musicians then because I worked with Big Youth and Dennis Brown. Shaka is my very good friend he comes to see me sometimes. I was always around music and people who deal with music. I used to dance with Owen Gray on stage. Though I don't make a big impact I am always there. So who was that last person that you said you danced with? Owen Gray. He was one of Jamaica's top musicians in the 70s. He made a lot of top tunes in those times. He's still going you know. He loves singing. It's funny because when I was a little boy and I ran away to Kingstown from the country I met a bloke called Bongo Colour and he was a bad dancer. He used to dance with Owen Gray and when I came to England I met Owen Gray and danced with Owen Gray. It was like he filled me in before I even came, showed me what to do. So tell me more about when you ran away to Kingstown. I used to love the music, like I told you, The Wailers, The Maytals. The Maytals they did a nice song and I loved the song so much I said I am going to runaway and join with them. So when I went to Kingstown I couldn't find The Maytals so I formed up with a brother called Alfred [Henry] and Brucey and we started to sing together. We went to Duke Reid to get a recording. On the Sunday morning while we were there waiting to go into the studio... there was lots of trouble all around Kingstown so the police didn't like for a big crowd to gather so we were all on the corner waiting for the studio to open and the police came along and told us to move. ‘You cant have so many people waiting in the same place.' Duke Reid came out and said ‘what's going on officer?' He said ‘too many people have gathered here and we can't have so many people in one place.' Duke Reid said, ‘all right I'll pickout some and the rest can come back next week.' I was one of the first people that Duke Reid picked. He said ‘You.' Me and Alfred we went into the studio and we heard people singing and the man turning them down. He was saying, ‘no that's not good enough.' He said to us, ‘go and come back.' When I went outside they said ‘no if they turned down them man they're going to turn us down. So let us go home and practise and again come back.' We went home and we started practising again to go back and that was when I got a letter from the High Commission saying my mother sent for me in England and I had to go next week. I had to leave everything there otherwise I am sure I would have made it through and been one of those Jamaican musicians who make it through. Where were you living before you ran away? I was living in St Thomas? And I ran away to Kingstown where I was living in Trench Town and from Trench Town to Jones Town and then from Jones Town to England. So how old were you and where were you living? How old were you when you ran away? When I ran away I think I was about 13. Where were you living and who were you living with? I was living with my grandmother in the country and my grandmother died. When my grandmother died it was like my whole world had gone with her. I tried to even run away from the island then but the ship that I went on to stowaway, it was too cold. [laughs] So I went back up and went back home but while I was there I was thinking about leaving the country. It's beautiful but as a youth I never realised what I was running away from or running to. I did always want to be a singer. I remember when I was ten years old I had an uncle who hit one of my sisters. I was angry with him but I couldn't hit him because he was big so I started to sing a song about him. All his horrible names I started to sing and when I finished I heard a clapping. When I looked it was another uncle of mine. He said that's very good we will have a concert, I want you to come along and sing it. I said no he will kill me. He said no we will protect you. So I went along to the concert and the whole village came out because my uncle is terrible if you call him names that he doesn't like. And there were all these names that I had in this song. So everybody came out in the village to see what was going to happen when I sang this song. This concert now penny was the pound. If you want to hear me sing again ten pounds or five pounds. Let him sing again. Someone else who didn't want me to sing again said I'll pay you 50 pounds for him not to sing again. They had me up and down, up and down, up and down. Until a lady said she was my manager, ‘we've had enough now we are finished.' I was only ten years old. It was good, that was a good one. So how old were you when you came over to England. I came to England when I was 16 and I still had the music in me. I still wanted to do music. I came to London and I was still trying to get into it. When you first landed was that in London? No I came to Bristol and then I went to live in London for a short while. So did you come over by boat and what was the culture shock like coming to England for the first time? I came over by plane, BOAC was the plane name. We landed in New York, stayed a while in New York for the night and then flew on to London. As a child I heard them saying Russia is a bad place and England, I imagined it was a nice sunny place with coconut trees and beaches. Me and my sister came together so while the plane is coming down through the cloud we could see buildings below and my sister looked out and said where are we now? I looked down and said, ‘Oh it must be Russia,' because snow was falling. All this aerial from the television and the thing looked like fog. I said this place looks terrible it must be Russia. Then I heard the pilot say, ‘buckle your seat belts you're about to land in London airport. My heart died. [Laughter] It never came back you know. It never came back. All the way from London to Bristol my sister was talking because she was very happy to see her mother but I was sad. I was looking out at where I am going like a dog away from his house. I watched the way so I could get back and when I looked at the journey I thought, ‘I can never get back.' My mother said why don't you say something. I had nothing to say and when I looked at her I said, ‘mum I want to go back.' She said, ‘you better work, find a job and work for your fare.' I couldn't get a job to find that fare so here I am. Here I am. I have a good time in Bristol you know but I love the Caribbean so much. There is something personal in my heart and even though I love Jamaica so much I love my village even more because that's where I first saw the light you know and that light hasn't burnt out it's still in my mind. One day soon I aught to return there. Pursue my music the same way until the day I shut shop. So tell me how Mellon Ears came about? Well, they were having a carnival. The first carnival at 70 or 72 somewhere around there. Yeah the St Pauls carnival. They said they wanted all of these people to sing. Then I joined up with Magguwan and Buggster and we came together and called it The Mellon Ears. I wrote a song called Move On. ‘We have come from so far but we are not at war so move on.' So we sang that at the first carnival and it was good. Since then we went on for a short while singing. That was the first show we did. Talking about Chris Parker and the Unites where did you meet up? There were continuing members though all of your bands? Who from Chris Parker and the Unites was in Mellon Ears? None were in Mellon Ears. So what happened with Mellon Ears why didn't that carry on? Magguwan went to London to live and that's when Mellon Ears fell apart and then Buggster formed Black Flames and went up north. Leewood didn't come back and Stanley, which is Joshua Moses. Those two didn't come back. They stayed with the band up there. Buggster didn't like it up there so they came back down here. They have been sitting around there for a while because at that time I was practising with a guy called Dalton Clark and he went back to Jamaica and that's when later I joined up back with Buggs and Black Flames. With The Mellon Ears did you have a backing band at any point? Yeah, we did have a backing band I don't remember who was backing us. I think it was the Atlantic Rollers. I am not sure I am not positive. The drummer from that was in [The Untouchables and then] Black Roots at a later date. Philip, yeah it was the Atlantic Rollers, Philip was the drummer who was the original Black Roots drummer so it was the Atlantic Rollers. So with the St Pauls riots can you remember any of the problems that the community that the problems that the community were experiencing or the tensions that were there before the riots happened? There was a big tension there because you have some youths who don't behave themselves and they mix up with those who behave themselves who hang about at the same place. So therefore there is anger in the community because they would think the police were picking on people when they were only doing their job but at the same time the innocent were getting hurt too. It made a lot of people angry. It caused problems you know. The whole community suffered for it. Since the riot I've noticed the changes that have come. The community broke up. I don't know why but there is no longer a St Pauls community like there used to be. They moved out the community and brought in new people. Right now if you lived around here and were looking for somewhere to live you could hardly get it around here. They move to Fishponds or Filton so the community is something of the past. They way we used to know it. I don't know. I heard some other people saying its ethnic cleansing I don't know if I would go so far because I think what they do is move the people away to prevent the same thing happening again. Too many people, just like I told you the police in Jamaica say, ‘we dont want so many people on this corner.' They dont want too many people to gather in one place. Do you think that there are external forces or people making an effort to change that? Is that what you are saying? Yeah I think they are making an effort to try and change it because even the carnival I don't think they are happy having it down here any more but they allow it because that's what the people want. You know but I don't think they are happy about having it down here any more. For instance the green here, it was a big green all the way up and the carnival used to be staged here and people could see from way down to Barton. They came and built up this building here in the middle of it you know. It's like they would like to stamp it out but the people want it because the young ones really enjoy themselves and that and I don't think they should deny them of it. So what were the kind of racial tensions there? Was there actual prejudice? There was racism but we always knew to ride over it but when the police came with an attitude it created a bigger problem because they are the ones who should be educating the younger ones to learn to live together in peace. Rather than that they came with brute force and created problems because whatever you are doing or whatever you are looking after you have to make sure you treat them all equal to get peace you know. I don't think that was going on here. It caused a lot of trouble. So you owned a shop called Popsy Curious on the corner of Grosvenor road? I sold hats, caps, records, dumplings, ripe bananas, bullet cake and frame photographs. I would go to London to get my stuff. To Birmingham. I look about for things that were not in Bristol and bring them here. Then I moved from that shop to 138 Grosvenor Road. That's the one you see in the picture there. That's where it was until the end. You were in a good position to see the riots from your shop? Yeah I did. I could see the build up. I saw when the police came to raid the Café [The Black and White Café]. I saw them bringing out the food and everything. What did trigger off the riots? Well to what I gather I saw the police came to raid, which they usually did in the summer. They came and raided, they take away the food and all the things. They came and they took away the food and they go on with it. When they took away the stuff I saw a crowd gather. I saw people start to run. I didn't know what happened but everybody ran. The next thing I saw was people coming from all about. Police coming from all about. Stone chucking. So I went and did my shop and locked it up. I didn't get involved so I didn't see much more of what happened but it went on all day and night. So what kind of time did it start? In the afternoon, I'd say about two or three in the afternoon and it carried on into the night. The police they left the community they said to prevent it spreading but later in the night probably about eleven, midnight they came back in bigger force and the few people left on the street they dispersed. It took a few days to return to normal. What were the after effects of that? Well, we lost our post office, that did burn. The bank they smashed up, lots of police cars burnt and some people were taken to jail and charged with reckless behaviour. I knew that was wrong because one bloke I knew was in there. He wouldn't kill a fly. They had him as the ringleader of it and I knew that was wrong. They were just charging people? Yeah, taking them to court and charging them with reckless behaviour. Some of us from the community went down there and showed our presence because we wanted to see justice done. If they prove that someone is guilty he should stand the consequences but we didn't want any innocents to get taken. About three people I am positive they are innocent to the charge that was put upon them. Some barrister came down from London to represent them and they all got off. They found them not guilty because the evidence wasn't there, it wasn't strong. Yes their was trouble but the people who were doing the damage they never caught those people. They caught the ones who were standing by looking. Up till that time we used to have loads of raids. It used to look like they used to have fun. I heard somebody say one person asked them when they came out of the café with the food, ‘what are you going to do with all of that food now and drink?' The police said, ‘we are going to have a party down the station.' I heard that's where it started. One of them rushed back to take the food from him and it turned into trouble. So what do you think of the current Stoke Croft riots? I didn't like it. It looked very frightening because I drive taxis sometimes at night and I was driving through there and it did look really frightening but the people they have a point. Tesco are trying to serve the community, yes it is, but it is killing off all of the small shops and the communities and the people are upset. We have a Tesco down in Eastville to shop, we don't need one in Stokes Croft. Leave it for the people, the poor ones to do something, but Tesco don't listen to anyone. Money talks. So the people show themselves, ‘we have the power, you might have the money.' So they attack their building. I don't support that there are peaceful ways of going about everything but that's the way they choose. I noticed they were trying to draw St Pauls into it because in the night they came down, the youths, all the way down Ashley Road and into St Pauls. They were acting up there like they were trying to get the St Pauls youth to join in with them. I think the few youths who live about there are smarter than that we have no trouble with Tesco so we just stood by and watched what was going on. So what are you up to at the moment with Handsome and the Positive Vibes. Handsome, well one brother brought him here, he brought Handsome for us to work together and Handsome came with a CD. When I listened to this CD it was good so I handed him my CD too but the other brother he wanted to be a lead singer and at the same time he didn't have one song that he had written. He just wanted to sing other peoples songs over. Handsome didn't like that so Handsome set up a later date for us to have a talk. The same thing I wanted is what he wanted. So then we brought this girl in Trinny, she's very good. The three of us we are working together. We did a show they didn't promote properly but we started off. Now we are working on an album which hopefully we will finish off soon. I think I will stick with them. If I go solo again I wont be going back into another group. This is my last group. Hopefully. Where did you come up with the name Popsy Curious? Well my name is Popsy and I used to call the shop curious. You know curiosity, you'll come and see what's there. I just say I am curious and Samuel he sings as well he sticks the name on me. That's what he called me, Curious. So is Popsy your first name or a stage name? My first name from when I was a child. OK thank you very much Popsy its been a really good interview. Well I enjoyed it too.